In this month of ghoulish monsters, ghosts, spiders and jack o lanterns the supernatural is fun for most everyone. 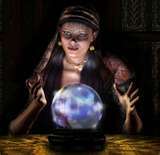 As a child, one of my favorite Halloween costumes was that of the fortune teller. Complete with cheap jewelry, a puffy Good-Will skirt, a long black wig from the drug store and an assorted collection of scarves, I carried my own crystal ball (one of those plastic shake and make it snow orbs) from house to house. Little did I know that my fantasy would someday become my reality. Although my wardrobe is now nowhere near as creative, I still get a thrill from the supernatural and mysterious. Many might consider my work as a professional intuitive to be the same as that of fortune teller, but there are definite differences. Although people go to intuitives and psychics to find out what is in their future, an authentic psychic knows that the future is not fully predictable. Despite what some in the psychic business would like for you to believe, we have free will and we are creating as we go. The future is a work in progress and you have more ability to manifest what you desire, than you might think. A psychic’s role is to assist you in making wise and positive choices. The ability to create is powerful and with intent, focus and awareness you can alter and change the course of your life. When a psychic predicts the future what they are predicating is the likely course of events based on current conditions. Once you know what path you are on and what the destination is, you have the ability to choose a different way. Simply knowing what is likely to come your way is often enough motivation to confront unconscious repetitive patterns and wake you up to new ways of being. There are times however when future events are more likely to occur and seem to be predestined. Many times I have given predictions that were surprising and slightly unbelievable to the person I was working with. For instance, I once told a woman living inNorth Carolina that she would go to China and adopt two children within two years. In her late-thirties, she already had three children and she laughed and told me that this was highly unlikely. Within the year the company her husband worked for was bought out by a Chinese firm. He was sent to China to work for eighteen months and when they returned home they brought with them two young girls that they adopted. I also told a confirmed forty something life-long lesbian that she would fall in love with and marry a man. Again she laughed, only to soon, meet a man, fall in love and eventually marry him. These instances and others like them are orchestrated from higher soul contracts that we have made before coming into this life. They seem inevitable and often shake us up bringing unexpected life altering change. A good psychic will be able to discern the difference between predestined future events and those that require your attention, choices and mindful intent. Intuitives and psychics can also help you to become aware of influences that might be hidden, the intent and character of others and provide a broader perspective without the influence of ego and fear. Some can communicate with unseen spiritual energies and tune into your soul’s purpose and alert you to opportunities for growth and expansion. It is important to work with authentic and genuine psychics who come highly recommended. The influence of a well-meaning but novice reader can create confusion, fear and create inner chaos. Supporting your higher aims, leading you to abundance, loving relationships and happiness— a psychic’s job is to lead you to your bliss. This entry was posted in Uncategorized on November 11, 2011 by Sherrie Dillard.